Mostly everyone loves hummus! I know personally, I forget what a nice snack this makes and what a great condiment it provides for sandwiches and meals. Instead of digging into a box of wheat thins, I ventured to some other alternatives. It’s great to switch it up. I enjoy black sesame brown rice snaps and Mary’s Gone Crackers but today I had a piece of toasted whole wheat pita bread cut into small pieces. Mary’s crackers by the way are organic, vegan and gluten-free- no GMO ingredients! I am a fan! I added cut carrot strips to this dish. 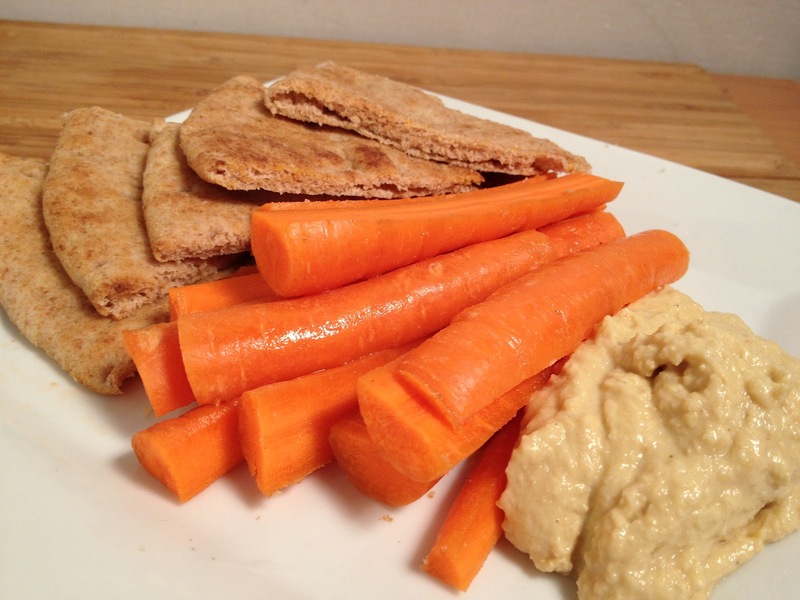 Raw vegetables work well with hummus too. It’s best to get into the habit of including vegetables to every meal possible. It helps to alkalinize the diet. Most Americans consume a highly acidic diet due to the over consumption of refined sugar, flours.. also sodas and coffee.. and yes meats, some grains and some dairy. The list is actually endless! Hummus is made mostly from chick peas making it a nice protein option for many! Recipes usually include chick peas, tahini, lemon juice, garlic, onion, parsley– and others include vegetable broth and soy sauce. I have a few recipes and will make it from scratch soon!